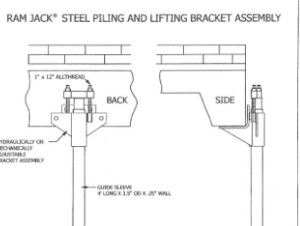 Bedrock Stabilizing Pier puts the pier bracket sleeve pipe bearing directly on the foundation. This bracket seat plate has a checkerboard weld pattern and a layer of neoprene (rubber) to adhere to the underside of your foundation. Combined with the checkerboard weld pattern, this pier will remain straight and will not roll out. 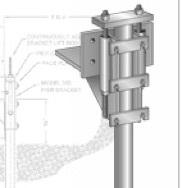 A longer bracket sleeve pipe also adds to the stability of this pier combined with a deeper gusset lessens the cantilever effect, also prevents roll and gives a more stabile, straighter and more reliable pier. You don’t want to ever do this again, but in the unfortunate circumstance that further settlement occurs, this pier is easily adjustable and guaranteed. In 2013 after driving several hundred piers, one pier required us to return for further adjustment. This took 4 hours for two men. The door straightened right back and works perfectly today. 1.Expansion anchors are only as good as the concrete they are attached to and often fail. 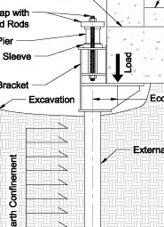 Often when drilling into a foundation you will hit rebar preventing it from going full depth. 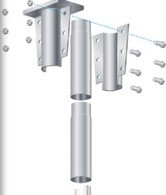 Expansion anchors are unreliable and nothing you would want to trust your foundation to. The Bedrock Stabilizing Pier doesn’t use or rely on expansion anchors. 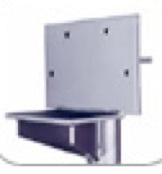 2.This pier puts the pier pipe closer virtually right on your foundation and closer than any other piering system. This reduces the cantilever effect and gives a straighter more stable drive. 4.Pier sections are 3” I.D. 3.5” O.D. schedule 80 black pipe with a wall thickness of .30” weighing 10.25 lbs/ft. Pier sections are 4’ with a 2.78” O.D. schedule 40 interior sleeve pipe to connect the sections and the pier begins with a 5’ starter. 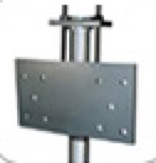 5.Other piers are designed to minimum standards and often fail when the lift exceeds lift capacity. Often homeowner are told they are only going to stabilize your home rather than lift it. Often they are told not to lift it. 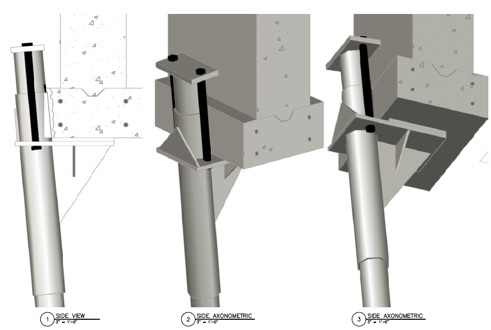 Bedrock Stabilizing piers exceed all of these lesser piers and whether we lift or stabilize is up to you. While we’re at it, we always prefer to lift your home back to where it belongs. This design puts the entire weight of your foundation on anchors. They will fail! On several jobs in 2013 we replaced failed piers like this.